Varazo, Inc. announces enhancements to its popular ClickSweeper pay per click automated management software. 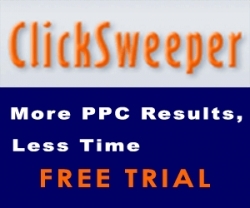 This latest update of ClickSweeper pay per click management software includes advanced campaign management features giving users the ability to easily set-up, manage and monitor multiple campaigns. Santa Clara, CA, September 20, 2011 --(PR.com)-- ClickSweeper’s new campaign management features allow users to easily create new campaigns for both Google and MSN simultaneously. Once a campaign is created, users can edit campaigns directly from the ClickSweeper edit screen. ClickSweeper 3.0 also provides users the ability to easily copy campaigns within and between accounts, providing significant time savings. In addition to the campaign management enhancements offered in ClickSweeper 3.0, new reporting features supporting PDF file format and graphic trend presentation were released early this year. With the addition of these latest features, ClickSweeper provides marketers with an advanced pay per click management tool to save time and optimize campaigns.